A pneumonia is defined as the inflammation of the tissue of the lung. Possible causes for pneumonia are bacteria, viruses, fungi, aspiration of gastric juice, parasites, toxins (eg. by inhaling caustic gases), and other factors. 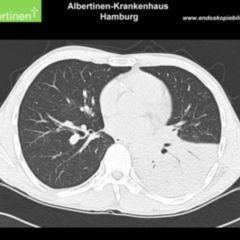 Bronchial pneumonia: Bronchial pneumonia is a multifocal pneumonia where the inflammation of different foci of bronchial tube infections spread to the tissue of the lung. The inflammation can affect one or several pulmonary lobules, and mostly occurs in multiple pulmonary lobes at a time. A bronchial pneumonia can develop by endobronchial, peribronchial or hematogenic spread. Interstitial pneumonia does not affect the alveoles, but the interstitium, i.e. the thin layer of connective tissue between the alveoles and the blood vessels. The causes - as far as they can be identified - can vary. Among others, you need to consider infections and inhalation toxicants (eg. cigarette smoke). Infection-caused interstitial pneumonia mostly develops by the pathogen being ingested by the alveolar macrophages and carried off to the supporting tissue. 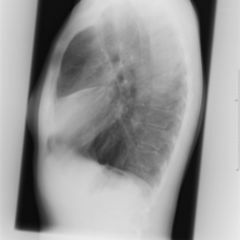 An interstitial pneumonia whose causes are unknown is called idiopathic interstitial pneumonia (IIP). It also comprises, among others, the desquamative interstitial pneumonia (DIP) being found in smokers, and the lymphoid interstitial pneumonia (LIP). Pneumonia acquired in a hospital is also called "hospital-acquired pneumonia"
Primary pneumonia: Occurs in previously healthy people. A special variant of primary pneumonia is newbornsí pneumonia. Retention pneumonia: Pneumonia caused by a displacement of the airways. Factors that favor the development of pneumonia are cigarette smoking, aspiration, condition after splenectomy, age above 60 years, age below 1 year, pre-existing viral infections of the airways (bronchitis), and treatment with immunosuppressants. The knowledge of the spectrum of pathogens causing pneumonia is important to the attending physician, since in the course of pneumonia therapy, the induction of a calculated antibiotic treatment before final pathogen diagnosis might become necessary. The various forms of pneumonia differ regarding their pathogenic agents, which are stated in summary below. 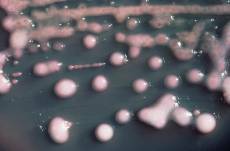 In community-acquired forms of alveolar pneumonia, streptococcus pneumoniae is by far the most common pathogen. 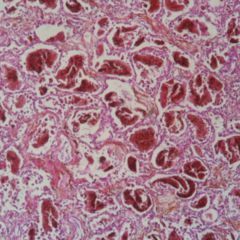 Mycoplasma pneumoniae is the most common pathogen in community-acquired interstitial pneumonia. In healthcare-associated pneumonia, knowledge of the spectrum of pathogens prevailing in the respective hospital is useful. In newborns, chlamydia trachomatis serotypes D-K and B-streptococci (eg. 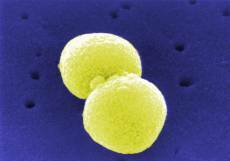 streptococcus agalactiae) are common pathogenic agents of pneumonia. Children are frequently affected by Respiratory Syncitial Virus. In children and adolescents, pneumonia caused by mycoplasma pneumoniae and haemophilus influenzae are relatively common compared to other age groups. In patients on artificial ventilation, gramnegative rod-shaped bacteria such as pseudomonas aeroginosa are frequently causes of pneumonia. In aspiration pneumonia, anaerobic bacteria often contribute to the cause. The inflammatory exsudate that collects in the alveoles leads to a limitated lung function with resulting shortness of breath. The respiratory rate increases, the patient suffers from fever and cough. In alveolar pneumonia, the cough is usually productive. In contrast to that, a dry cough is characteristic for interstitial pneumonia. During auscultation, you typically can hear wet rales. In lobar pneumonia, during auscultation, you can hear the characteristic bronchial respiration. During percussion, the resonance over the affected lobe is notably reduced. Whereas, the vocal fremitus and bronchphony are amplified. When, in addition to that, the pleura is inflamed, too (pleuritis), the patient suffers from pain changing in intensity depending on the position of respiration. Typically, the patient takes a relieving posture, with the body inclined to the affected side and shallow breathing. If the pneumonia is not showing the typical symptoms of pneumonia in auscultation and percussion, you call it an atypical pneumonia. Alongside taking the medical history and a physical exam, you have a variety of methods available for diagnostics. For the isolation and identification of the pathogen, you can take sputum, blood cultures, pleural punctates, bronchial secretions and serological exams from the blood and urine. In complex cases, taking a biopsy sample might become necessary. 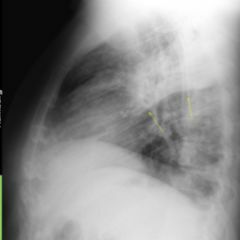 An X-ray of the chest can bring clarity regarding existing opacities, coin lesions and atelectasis. Laboratory medicine exams contribute to securing the diagnosis. The severity of a community-acquired pneumonia can be estimated using the CRB-65-index. In cases of pre-existing diabetes mellitus, you should think of an infection with pneumococci or staphylococcus aureus at first. In cases of alcoholism, klebsiella pneumoniae should be considered as pathogenic agent. In cases of COPD, haemophilus influenzae and moraxella catarrhalis are frequent pathogens. In patients who previously underwent splenectomy, encapsulated microorganisms, i.e. pneumococci and haemophilus influenzae, are to be expected. In patients with immunosuppression, eg. by HIV or short-ago chemotherapy, all atypical and opportunistic pathogens should be considered. They comprise, alongside tuberculosis and pneumocystosis, lung afflictions by cryptococcus neoformans and also the atypical mycobacteriosis. For the therapy of pneumonia caused by bacteria, it's advisable to use antibiotics. For that, it is important to induce broad-spectrum calculated chemotherapy with the potentially most effective antibiotics on the basis of the pathogen to be expected. In cases of lack of improvement of the patientís condition, therapy can be changed. Upon detection of the pathogen, you can go back to an antibiotic with a smaller efficacy spectrum, if possible. 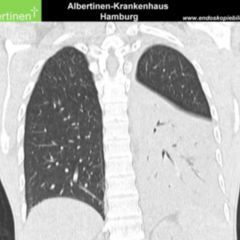 In (1) and (2), you can find sources with further information on the therapy of bacterial pneumonia in general, and on healthcare-associated pneumonia in particular (in German). Viral pneumonia cannot be treated sufficiently with the existing virostatics. Therefore, therapy comprises symptomatic treatment of the inflammation alongside the general measures. The use of antibiotics in viral pneumonia is reasonable for the treatment or prevention of a bacterial superinfection. However, you can take a wait-and-see approach in purely viral forms under control of laboratory inflammation parameters (blood cell count, ESR, CRP).